One of my favorite meals that my mom made when I was younger was stuffed zucchini. Of course, living with my Italian father, her version included ground beef, rice, tomato sauce and other assorted veggies, topped with parmesan cheese. Don’t get me wrong – I loved that version; but I have made changes in my diet that warrant some alterations to the original recipe! 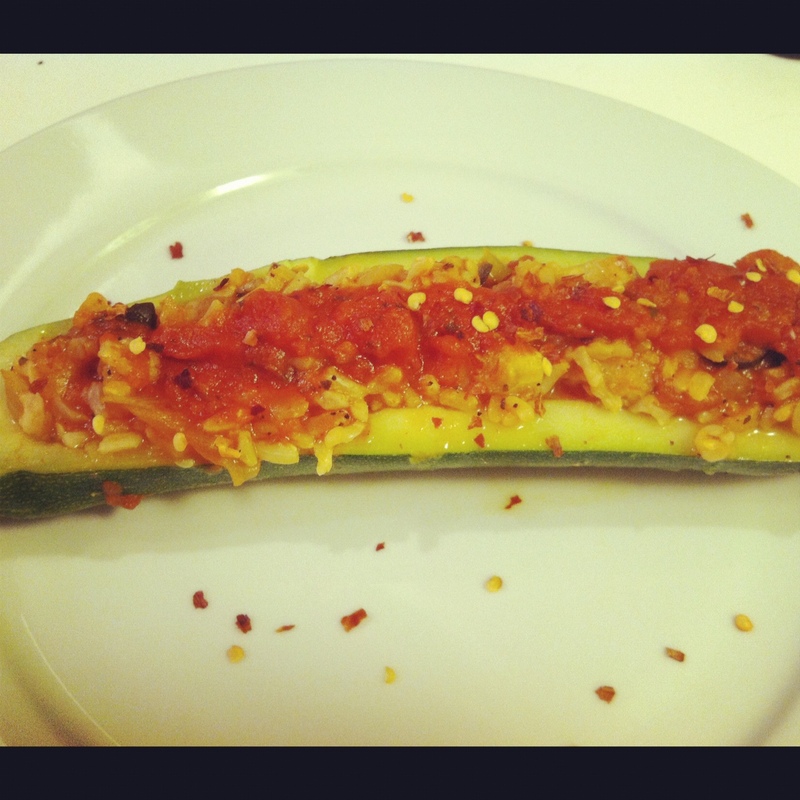 My new version of the stuffed zucchini incorporates brown rice, onion, garlic, green bell pepper, olives and tomato sauce. The meal is healthy, filling, and extremely satisfying! I used to miss the taste of parmesan cheese with all of my pasta and Italian dishes, but my taste for it has definitely dwindled now that I have been vegan for about two months. I usually toss on some red pepper flakes for a kick (I even tried some sriracha with it and it was tasty) or sprinkle on some nutritional yeast for a bit of a cheesy flavor. 1. Start your rice – I use a rice cooker, so I can set it and continue with the recipe. For 1.5 cups of uncooked rice, I use about 2.5 cups of water. I find that using a full 3 cups makes the rice soggy. If you use the stove top method, prepare 1.5 cups of uncooked rice according to the directions on the package. 2. Preheat your oven to 375 degrees. Heat the olive oil in a large saute pan over medium heat. Chop up your garlic, onion, and bell pepper and add them to the pan. Cook until onions start to become translucent, about 5-6 minutes. 3. While ingredients are in the pan, slice your zucchinis lengthwise – try to slice them so that both halves will be able to lay flat, skin side down. Using a spoon, carve out the seeds and soft insides of each half, much like you would do with a larger squash or pumpkin. Set the scrapings aside. Make sure that you don’t scrape too much out – you should have about 1/4-1/2 inch left (see picture below). 4. Chop up about half of the zucchini insides and add them, along with the olives, into the saute pan. Pour in 1/2 of the pasta sauce and saute the mixture until heated through, about 5 minutes. 5. Once your rice is done, add it to your saute pan – I wound up using only a cup of the cooked rice so that it didn’t take over the veggies too much. You may need to add another quarter of the jar of pasta sauce since the rice will soak some of it up. Season with salt, pepper, and red pepper flakes to taste and cook until thoroughly mixed and heated through. 6. While the veggies are cooking, set your zucchini halves in a baking pan and fill the pan with hot water until it covers 3/4 of each zucchini. This water will help to cook the zucchini through while in the oven. 7. When thoroughly heated, scoop a heaping portion of the veggie mixture into the middle of each zucchini half. Once each zucchini is filled, spoon the remainder of the pasta sauce over the top of each . 8. Cover your pan (I had to use two because my zucchinis were large) with tin foil and bake for 20-25 minutes at 375 degrees, or until the zucchini is fork tender. 9. Garnish with more red pepper flakes, sriracha, fresh basil or anything else that your heart desires! Enjoy! What is your favorite childhood meal that you have veganized? Share your story in the comments below! Your dish looks very tasty! My mom always made me cucumber and cheese sandwiches as a kid which was fine when I became vegetarian. Nowadays I often use vegan cheese or hummus with the cucumbers. I often use hummus to replace cheese on sandwiches and it works well! I hated peanut butter as a kid, so I always had jelly sandwiches! Grilled cheese was a favorite, too. I have yet to try a vegan grilled cheese, but it’s on my list! I like the hummus idea – I’m not a huge sandwich person, so it’s rare that I really miss cheese on a sandwich, but I think hummus in a wrap with veggies would be delish!